Prime Minister Narendra Modi on Monday night cautioned against any unilateral steps that will lead to an economic barrier in the battle against climate change as he hoped that the developed countries would mobilise USD 100 billion (Rs 6,600 crore) annually by 2020 for mitigation and adaptation. Addressing the COP 21 conference in Paris, Modi also hoped that the developed countries will fulfill their commitments in a transparent manner. "The principles of equity and common but differentiated responsibilities must remain the bedrock of our collective enterprise," Modi said, adding that there should be aggressive mitigative action by developed countries by 2020. Modi also underlined the need for a national will and genuine global partnership while taking steps to hammer out a climate change deal. "We look to the developed countries to mobilise 100 billion US Dollars annually by 2020 for mitigation and adaptation," he said. Modi called on the developed nations to fulfil their commitment in a credible, transparent and meaningful manner. As negotiators from over 190 countries sit down over the next few days to hammer out an agreement, Modi said developed nations, which have a larger carbon footprint, should take the lead in addressing the climate change issues. "It is not just a question of historical responsibility. We hope advanced nations will assume ambitious targets and pursue them as they have the most room for impact," Modi said at COP 21 plenary. The prime minister also told the audience that democratic India must grow rapidly to meet the aspirations of 1.25 billion people, 300 million of whom are without access to energy. "The prosperous still have a strong carbon footprint but the world's billions at the bottom of the development ladder are seeking space to grow," Modi said. "We will succeed if we have the wisdom to craft a collective partnership that balances responsibilities and capabilities," he said. Modi asserted that conventional energy was needed but it should be made clean. At the start of his address, Modi refereed to the horrific Paris attacks earlier this month that claimed over 120 lives. "The pain of Paris is yet to heal. So, I speak in admiration for your resilience and resolve. And, I salute the world for standing, in full strength, with France and Paris," Modi said. He noted that over next few days, nations will decide the fate of this planet. "We do so when the consequences of the industrial age powered by fossil fuel are evident, especially on the lives of the poor," Modi said. Asserting that the choices are "not easy", Modi said, "We have awareness and technology. We need now national will and a genuine global partnership." Modi also listed India's ambitious targets to tackle climate change. By 2030, India will reduce emissions by 35 per cent of 2005 levels, and 40 per cent of its installed capacity will be from non-fossil fuels, he highlighted. "We will achieve it by expanding renewable energy -- for, example, by adding 175 Gigawatts of renewable generation by 2022. We will enlarge our forest cover to absorb at least 2.5 billion tonnes worth of carbon dioxide," Modi said. "We are reducing dependence on fossil fuel through levies and reduction in subsidies; switching sources of fuel where possible; and, transforming cities and public transportation," he said. 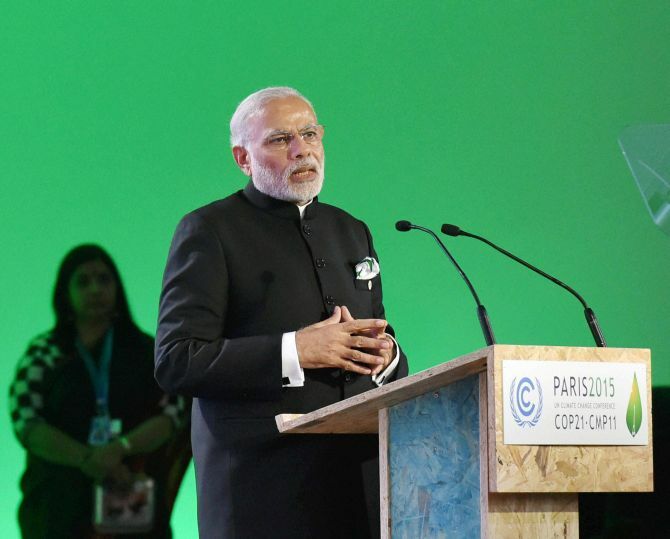 Modi stressed that climate justice demands that, with the little carbon space that is still available, developing countries should have enough scope to grow. "This also means aggressive mitigation action by developed countries before 2020, including ratification of 2nd Commitment period of Kyoto Protocol, removing conditions and revisiting targets," the Prime Minister said. He asserted that equity means that national commitments must be consistent with the carbon space nations occupy. He said there was a need for a strong agreement on adaptation and loss and damage. "Developed countries must fulfil their responsibility to make clean energy available, affordable and accessible to all in the developing world. This is in our collective interest," Modi said. "Energy is a basic human need. So, we need an ambitious technology initiative, driven by a public purpose, not just market incentives. For this, we need to scale up Green Climate Fund that will improve access to technology and intellectual property," he said. Modi highlighted that the presence of 196 countries gives a message that there is a chance to unite behind a common purpose. "We will succeed if we have the wisdom and courage to craft a genuinely collective partnership that balances responsibilities and capabilities with aspirations and needs. I am confident that we will," he concluded. Paris Climate Conference will for the first time in over 20 years of UN negotiations, aim to achieve a legally binding universal agreement on climate, with the aim of keeping global warming below 2°C.